Experiencing downtown Coldwater is a treat for young and old. Located on the Heritage Route, US-12, just west of I-69, downtown Coldwater has a charming historic atmosphere. Since its beginning as a trading post along the Chicago Military Road in the 1820s, Coldwater's downtown business district has served as the center of commerce in Branch County. With its combination of historic buildings and interstate accessibility, downtown Coldwater offers a unique shopping experience. 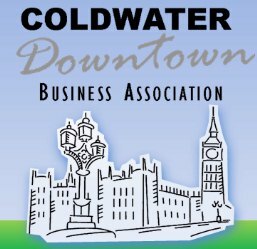 Just one more reason to come experience downtown Coldwater! Page Last Updated 2016/07/10. © 2007-16 MyColdwater.com - Coldwater, Michigan. All Rights Reserved.